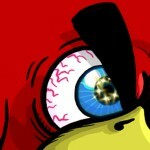 Here is our walkthrough strategy for Angry Birds Seasons Invasion of the Egg Snatchers Level 2-30. The score in the video below is 352,230. You can read more about the Invasion of the Egg Snatchers update and find helpful links here. Thank you for the updates @e-star. Sometimes you can get the little helicopter to fall and trigger the crane to drop on the first shot. Can anyone give me a hint as to how to get the mighty eagle on this level? I am at 99%, and have been forever. Thanks! Answered my own question. (And I was at 98%, not 99. :-)) I destroyed everything I could, except I didn’t release the police cars. Used all birds and left them floating in the water then sent the tuna can over to the left and let it slide down the police car runway. That did it! @jmf i know it’s been A while, not even sure if your active or will even get this note, but How do you Not release the police cars,, i can’t help but hitting that trigger thingie’? Thanks this worked for me also ? 362550 achieved as per the video, however the helicopter came down after flinging the second bird. First bird takes out helicopter. 2nd bird through trigger, manually detonate to take out tnts. 3rd bird in high arc to take out last pig next to flashing red light and rest of misc. debris. 1 bird left. That’s how I did it too. Takes a few tries, but you will get enough destruction for three stars. Must admit I found this chapter rather difficult, some levels weren’t so bad but others seemed almost impossible. It was enjoyable though. I did the first shot like the video except a tad higher so that both pigs in the helicopter came down and the trigger set off the police cars without hitting the top right tnt. Second shot also similar to the video except a tad lower so that bomb bird traveled further down the creature’s spine before exploding, still leaving the top right tnt intact. Third shot like the video, then while Terence was still in play bouncing around destroying debris in the water, sent Matilda over dropping her egg on some of the remaining debris on the right then bouncing up into the tnt taking down the last pig and the cranes on top. Overall a modification of the video strat to use all four birds, which worked better for me to get a higher score. 367060/4 with the same first three birds, but was sending the 4th in high arc to bomb debris in middle and hit the top-left corner of the crane, the idea being that the remnants crane falling down on the tnt makes those into projectiles potentially doing a lot of damage. @vuelva @hallieginsb thanks for the great tips, i haven’t really delved into this episode yet, but am trying to collect feathers, there are no longer walkthrough for the ME hopefully one of you managed it? I’m at 99% and no matter what i do can’t manage TD any tips? @skowse I’ve kinda been stalking you trying to acheive TD throughout seasons, thank you for posting, did you get this one? @kathy So sorry, can’t help with the ME on this one. I’m not a big fan of the ME and don’t play for feathers unless I need to in order to unlock a bonus level. I hope someone else can give you some pointers. Thanks for the reply @hallieginsb appreciate it thanks? I’m just bored with flinging, figured I’d go through and collect some feathers. I finally got it using a strat mentioned above ? never played ME and don’t even know what feathers or TD are, so sorry that i can’t help you @kathy , but i see you found it anyway. Well h here i am again trying to scrape together a few more points, but Noooo.. can’t even reach my previous 359k !! almost everything destroyed, but still my best this run is 251k. Never mind! I just cleared it after forever with the egg bird left. I don’t know any of the names of the birds when you guys are talking about them. How do I find that out? @conehead55 would you mind uploading a screenshot, showing your score? There was no response, so score has been deleted.